We woke up last weekend in need of a distraction from the stress of the workweek (yes, this has been a theme lately). 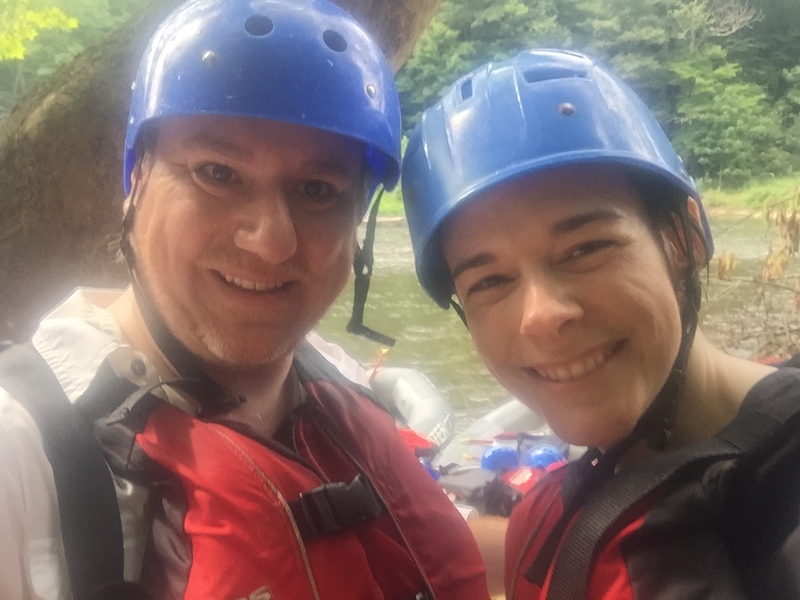 With a few quick phone calls we had reservations for a white water rafting tour in nearby Ohiopyle, PA. We had just enough time to throw on some river-worthy clothes and shoes and hop in the car for a 90-minute trip. Well. It should have taken about 90 minutes. We’d been warned that map apps had trouble finding the gathering place, but we were also given a few landmarks to guide us the last couple of miles. We knew we were on the right road, but somehow 188 sat several miles away from 113 — and with a lot of other numbers in between. 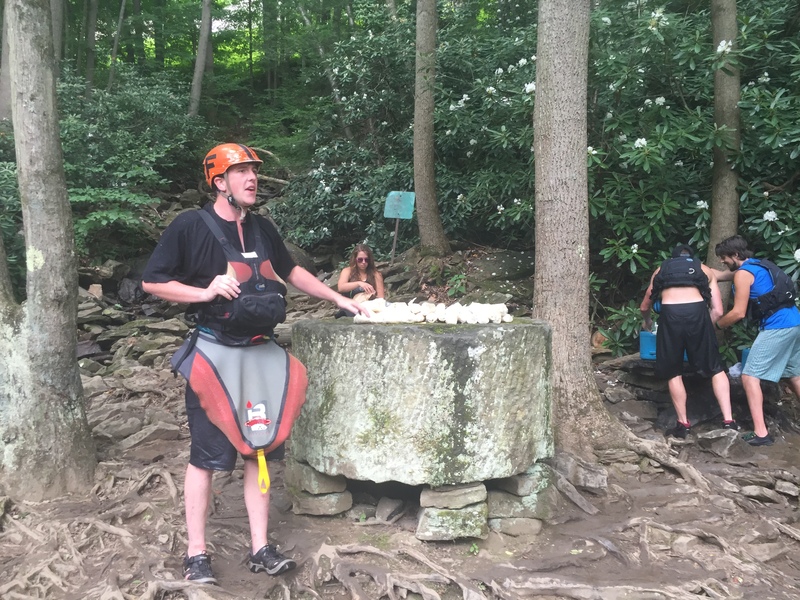 We were able to check in with our raft trip company, White Water Adventures, in the nick of time. We were fitted with our life jackets, issued paddles and loaded up onto a bus for a short trip to the put-in. The group was large, at least 15 boats, and only a handful of guides. We were informed that our guides would be in kayaks and each boat choses a captain. I was quickly chosen as captain because of my experience (I spent about six years as a guide on the Shenandoah and Potomac Rivers) and we settled in for the trip talk. I guess it doesn’t matter where you raft or where you guide, the trip talk is always the same. You talk about safety, how to grab a throw rope, and even tell the same jokes like the explanation of “Summer Teeth.” I don’t doubt that somewhere in south America right now there’s a guide explaining that if you’re carless with your paddle you’ll give someone Summer Teeth. That’s a cosmetic condition when you hit someone in the face with a paddle and some of their teeth end up in the water and some in the boat. We carried the boat with our crew mates, another couple named Alison and Ken, down to the water and began our journey. The lower Youghiogheny River trip takes about four hours and is composed of class three and four rapids. The classification of rapids is on a 1- 6 scale, one is basically flat water and six is extremely dangerous — even pros should think at least twice (if not three or four times) before attempting a six. If you want a fun first trip and are in shape with no medical problems, classes three and four are okay. The rapids have names like Dimple Rock, River’s End and Cucumber, and come at a pretty quick pace. You don’t have to worry about a lot of flat water leaving you bored. The river is recommend for ages 12 and up with little or no experience in white water. The company provides a light snack about halfway through as well. I’d suggest that you bring some water in a container that can be fastened to a raft’s D-ring as well as put on plenty of sunblock BEFORE you depart for the boats. I was amazed at how easily things came back to me. I was able to read the water, steer, and shout commands loud and clear. We didn’t lose a person out of our boat once, even on the class fours that the guides explained multiple times how to enter and navigate. The guides at a couple points would go on ahead and stand on nearby rocks and give us hand singles on how to paddle. I’m not really a fan of that system, but it worked. Amanda had never been rafting before, but took to it quickly. It was a good distraction from work; you can’t be stressing out about your day job when you’re busy trying to stay firmly planted in a raft. I did have to encourage her to *stop* paddling a few times; she turned the raft in a complete circle on her own at least once. The trip was fun and we had the chance to unwind and be distracted from the other stresses in life during our adventure. I could barely move the next day, and my voice sounded like I was gargling with gravel from all the shouting, but I did it. In the moment I guided a trip an didn’t lose anyone out of the boat. I think that is something to be proud of. I’m happy we went. I wouldn’t mind going again and Amanda did so well we could go on the Upper Youghiogheny, which is full of class four and five rapids. I loved the few ours of reliving my youth, and the pain the following day was well worth knowing I’ve still got it. The price is $70 per person April through October.